Searchlight New Mexico is a non-partisan, nonprofit news organization dedicated to investigative reporting and innovative data journalism. 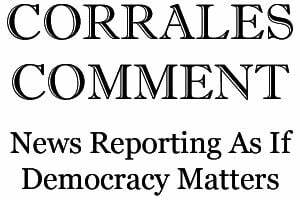 In a landscape of shrinking media resources, our mission is to focus high-impact investigative journalism on topics of local, regional and national interest in order to allow the public to see into the remote recess of government and institutional intrigue and to expose abuses of power by government, business and other institutions. We believe great reporting empowers people to demand honest, effective public policy and to seek appropriate remedies. In order to meet the ever-changing demands of readers and advertisers in today's multimedia landscape, publishers must have the resources necessary to thrive, not just survive. In order to achieve this, every department and staff member needs to be able to contribute to the bottom line of the operation by having the resources necessary to be successful. So how do you arm each with the best resources to achieve success? This is where Metro, for over a century, plays a vital role with solution-based image content, ideas, spec ads and technology -- all driven by our commitment to deliver what publishers like you need, when they need it, at a rate that will be returned hundreds of times over. No other company provides the spectrum of services and solutions that reach and affect nearly every facet of a publisher's operation. Metro's partnership with the media industry is based upon over a century-long relationship where, together, we identify what publishers need to be successful with their advertising endeavors and Metro responds with solutions. Metro continues to invest in building the very best resources for companies like yours for one simple reason: to faciliate the creation and sale of print and digital advertising so you make money, succeed and thrive. You have a fundamental right to know what your government is doing, and that includes the right to inspect public records and the right to attend public meetings. NMFOG works to make sure these rights are strong and available to everyone. Sometimes, this means assisting individual citizens who are denied information by local or state government. It also means strengthening and broadening freedom-of-information laws through legislation and litigation. And it means educating the public and public officials about the letter and spirit of sunshine laws. Publication Printers Corp. has been family-owned and operated since we opened our doors in 1979. Now one of the leading web printers in the United States, we offer our customers all the benefits of a publicly held corporation while maintaining the same high standards of service we started with over 35 years ago. The story of Shweiki’s publication printing history goes back to 1984. At the time, while a student at the University of Texas at Austin, Gal Shweiki had an idea to create a guide book for students that listed all the best places to hang out. This idea led to The Student Guide to Austin. This was Shweiki’s entry into the publishing field. In 1988, realizing the need for a monthly entertainment publication for the students, Shweiki began publishing Study Breaks magazine. As the magazine grew, Shweiki and his staff began working with other publishers, helping with design and pre-press solutions. This led to the purchase of the first web press. Since then Shweiki Media has grown to be a full service printing company, and a prime resource for publication publishers. The Ultimate PrintSource, Inc was created in 1994 with a merger of two companies JL Printing (owned and operated by Jon & Edith Le Leux) and Dez Dezign Printing (owned and operated by Jeff & Desirée Ferrazzano). The merger was born when Jeff saw a need for a reliable wholesale/trade printer who could offer more than just one specialized product. He had a vision to create a Christian owned and operated company that could provide a source for all kinds of wholesale printing from one location. He sought out a Christian partner who was one Spitritually grounded and who also had a vast printing knowledge including maintenance and repair of equipment. Jon and Jeff's roots started at a Calvary Chapel Chino Valley men's retreat. Starting with 3 employees, 3 sheetfed presses and a purchase of a 6 color web press the company has grown to 30 employees, 3 web presses including a 27" x 22" 8-color heatset web, a 11" x 17" 8-color open web, 4 Digital Presses that have Booklet Making in-line, 14" x 20 4-color Hamada and several smaller presses, a AGFA Avalon CTP plate setter and full bindery & mailing services. We're pleased to have you visit the online version of the Albuquerque Business First, where you'll find the latest breaking business news, updated throughout the day; this week's top stories from the Business First and other popular features from the weekly edition. You also can sign up to receive any of our email products, such as our daily email updates and the latest networking and marketing alerts. You'll also learn how to become a regular Business First subscriber and receive information about how to become an advertiser. And you'll notice that you're able to access 42 other local business newspapers owned by our parent company, American City Business Journals [acbj.com], as well as other Business Journal sites with more information for the busy business person. If you would like to learn more about American City Business Journals, please visit acbj.com. We hope you'll let us hear from you. We keep it simple when it comes to TV entertainment. Our editorial team of veteran TV critics, feature writers and extreme TV fanatics sorts through hundreds of programming schedules and watches countless hours of TV to keep readers in the know on what’s new and what’s worth watching on TV every day. With so many channels available today, we cut through the clutter and make it easy for readers to discover new shows, new channels and niche content specific to their interests. Through our magazines and corresponding websites, our readers rely on us to tell them about high-profile specials, original movies, new series, season finales and the people and stars who are all a part of it. Readers count on us to make TV time simple, fun and fulfilling. Weekly Alibi, commonly referred to as The Alibi, is a free weekly arts, culture, and entertainment newspaper published in Albuquerque, New Mexico. The newspaper contains information about culture, politics and events within New Mexico's largest city, and is distributed across New Mexico's largest markets. The main features are: the calendar listings; reviews and guides to arts, literature, entertainment and film; its "Chowtown" restaurant guide and its "Best of Burque" award issues, which cover everything from "Best Community Action Group" and "Best All-You-Can-Eat" to "Best Gay Bar". There are many ways to show support for the New Mexico Press Association and the newspaper industry in New Mexico, but the best way is to become a member.